A cut from its colonial masters, the Colombo centric tea industry was there on Thursday to toast for the next 50 years of Ceylon tea at the main event of the Global tea party celebrating 150 years of tea in Sri Lanka. During the main tea party celebrations held at the Galle Face hotel there was a marked absence of tea served, except during the first half of the event and at the stalls of the tea manufacturers. 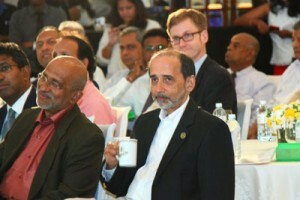 There were also a few glitches like the inability to connect with the rest of the world celebrating the event while just a handful of the industry was present including organizers Colombo Tea Traders Association (CTTA) and the Sri Lanka Tea Board (SLTB) and Plantations Ministry officials. During the event Plantations Minister Navin Dissanayake addressing this main ‘Global Tea Party in Colombo’ said the government is set to find a solution to the long drawn battle between Glyphosate users and advocates against its application this week. Queried further on the sidelines of the event on the possibility of lifting the ban on glyphosate for the tea industry, he said, “I’m sick of it.” He also noted that despite red tape very soon the government would start the global promotion campaign for tea. Colombo Brokers Association Chairman Anil Cooke commenting on the celebrations asserted this to be the “biggest ever tea experience the world has seen,” highlighting that it was being celebrated in over 60 countries at that time. SLTB Chairman Rohan Pethiyagoda proposed the toast to the next 50 years of tea in Sri Lanka for which all the key attendees raised a mug!